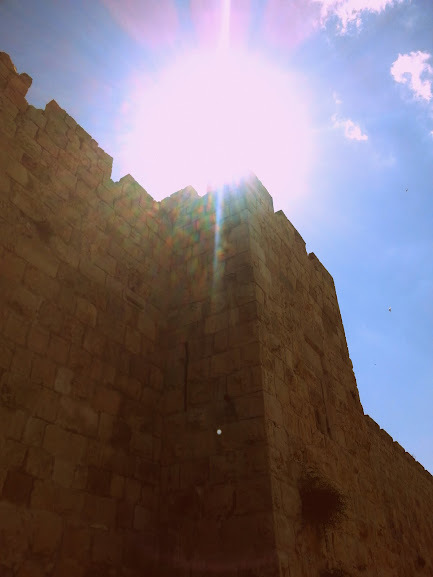 This series begins with Secret Passages, read that first to get the whole of my Jerusalem journey. As we search for the entrance to the ramparts, the fortified walls that once protected the old city, we meet two workmen, enjoying a relaxing moment in the shade and a small cup of cold water. Before we can ask for directions thwy graciously insist we share their water, then, with the help of dramtic hand gestures, they direct us behind them through a small gate. The gate serves as the entrance to a schoolyard where two blue-eyed Israeli children giddily lead us to a part of the fence that can be easily hopped. As we jump over the fence they stare for a moment then run away giggling and squealing in rapid Hebrew. 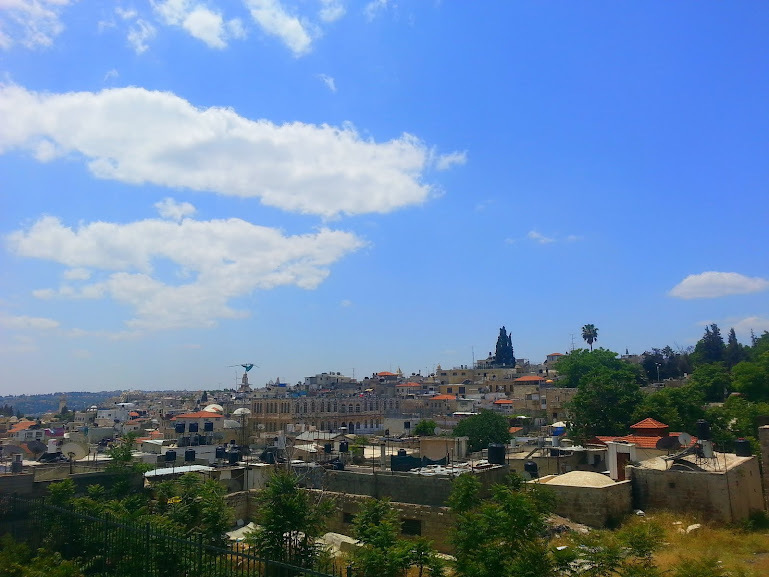 On top of these walls, walls that once held a whole city inside, we can see the sprawling Jerusalem Stone buildings dotting the hills and gathering in the valleys. 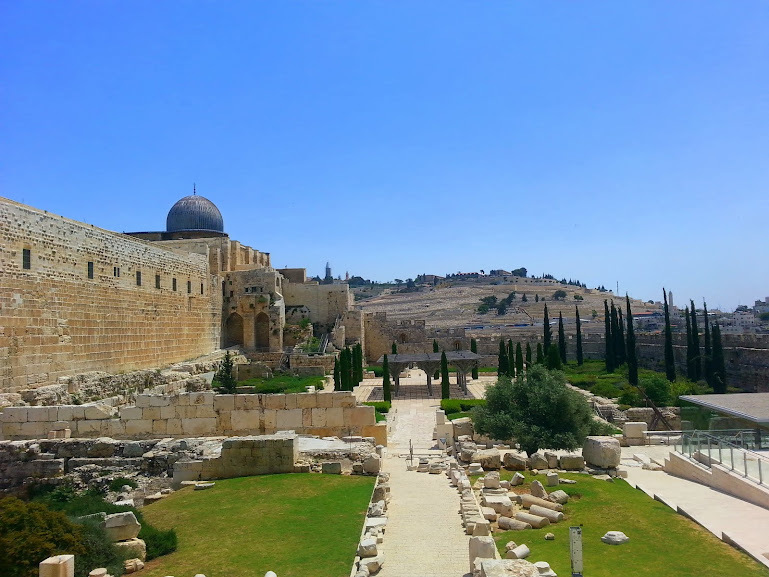 We make our way down from the ramparts and find our way to the top of a hill overlooking the Western Wall, Dome of the Rock, and The Mount of Olives Cemetery. A spectacular landscape, that has remained mostly unchanged for centuries. The Western Wall has survived not only thousands of years but many attacks and attempts at it’s desolation; boulders from first century Roman attacks remain strewn haphazardly around the wall. The land where the Temple once stood now holds a magnificent golden roofed mosque, Dome of the Rock. As it is a contested area, only Muslims are permitted to enter the mosque. The Mount of Olives is the most expensive Jewish cemetery in the world, where, according to the Torah, the Messiah will rise and walk across providing the first gifts of salvation to the dead who rest there. 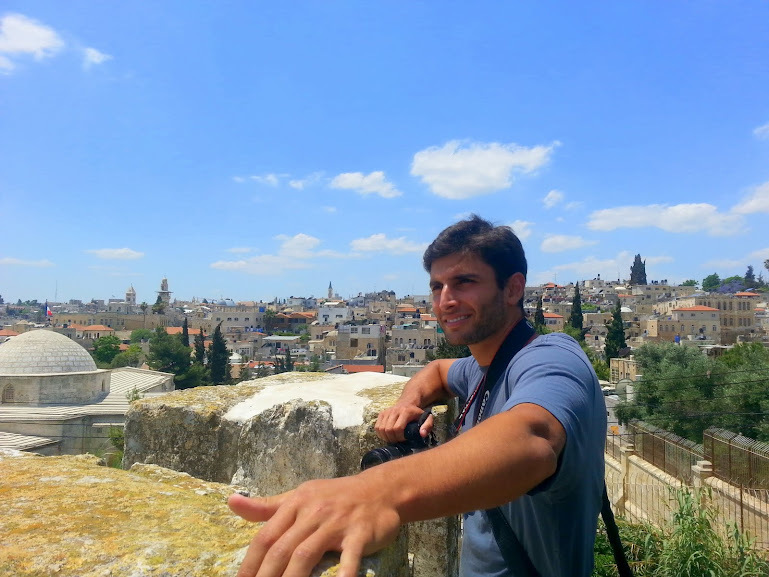 The impressive scene filled with some of the most important religious sites in the world is humbling. We separate to visit the Western Wall (a barrier separates men from women at The Wall), I apprehensively approach the holy site. Fearful of offending a more devout person, I feel out of place, an impostor. Yet the more I watch the women swaying as they sing and pray, their hands and foreheads dutifully pressing against the wall, the more comfortably bold I feel. Inspired by the unimposing devotees and the joyful songs wafting from the men’s side of the wall, I move forward, press my hand to the wall, and close my eyes. Lost in a meditation, the energy of thousands of years and millions of people sweep through me. I don’t know how long I stood, grasping the wall, listening to generations of love and loss, hopes and fears, mistakes and successes. At last I feel the pull on my heart slacken. I open my eyes and step away allowing the remaining energy wash over me. We leave quietly from that holy place, letting the sun warm us as we feel the ancient energies dissipate with each step. Yes its amazing I hope you can go! wow. this is just so very magical. i feel like i was at that wall with you. thank you!